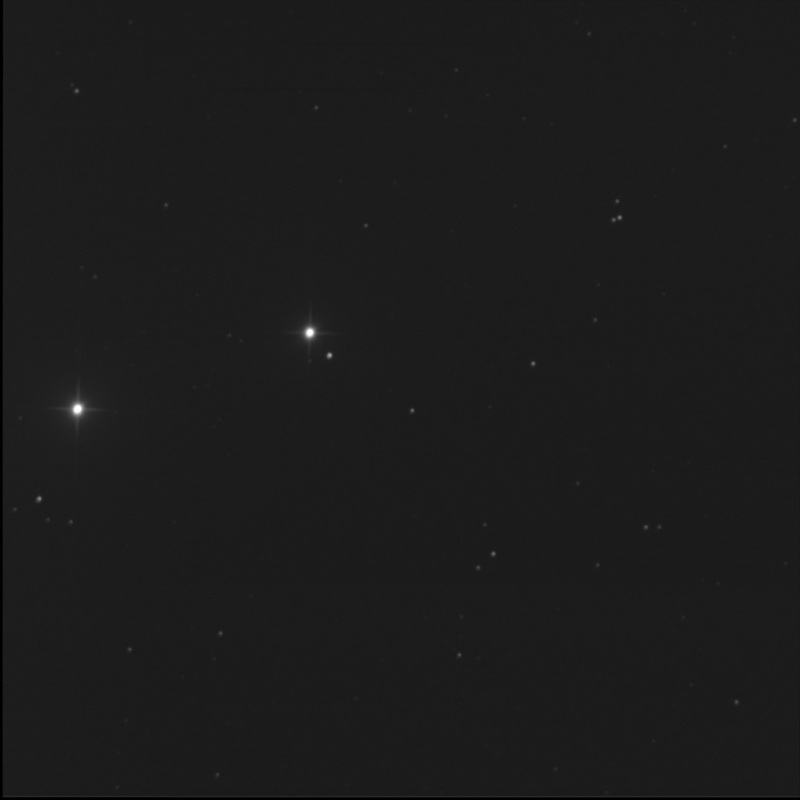 I asked Burke-Gaffney Observatory to image the alpha Capricorni multi-star system. That is α1 and α2 Cap. Centred on GSC 05748-2586. 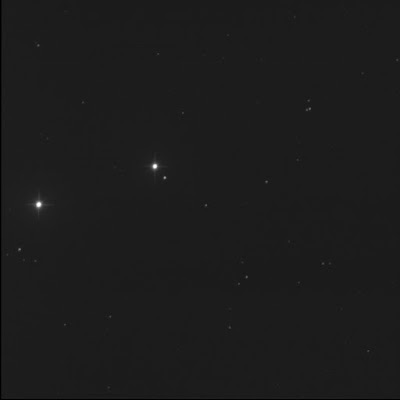 The extremely wide pair of bright stars are a wide visual optical double. But each bright star is a multi-star system in its own right. alpha 2 is at the far left or east-most; alpha 1 is west or near centre. Luminance only, 1 seconds subexposures, 20 stacked shots. FITS Liberator, Paint. North is up; east is left. Due south of α1 is a faint point, possibly elongated. According to SkyTools 3 Professional, this is the location of the B and D stars, both in the magnitude 14 bucket! When I zoom in, I feel like there's a bright point to the north-west and a faint one to the south-east. The HJ 207 C is the somewhat bright star south-west of α1. ST3P also notes an E star, less than 1 arc-second from the primary. Ah. Below α2, aka HJ 608, slightly east, is a somewhat bright star (although less than alpha 1 C) in a gaggle of faint stars. This is α2 D, aka PPM 721720 and AGC 12. The little triangle of nearly equal stars to the west-north-west of α1 is HJ 2943. A grouping I had viewed a year ago.